Are the Duke and Duchess of Cambridge planning a third baby?! They’re already parents to adorable Prince George and Princess Charlotte, but it seems we finally have somewhat of an answer as to whether the Duke and Duchess of Cambridge are planning for a third child! The couple are currently in the middle of a five-day tour of Poland and Germany with their two children, after arriving on Monday 17th July to an excited awaiting audience. Early on in the day, the couple were whisked to an official reception for start-up companies in the country, shortly after meeting with the Polish president, Andrjez Duda. But the topic of further children for the couple arose when the pair were presented with a rather unusual gift by a member of the reception – a cuddly toy designed to soothe newborn babies. Given that George and Charlotte and now two and three, admittedly the toy wasn’t quite right. But the gift prompted the Duchess to give a little insight into whether she and William are planning a third child. When she was handed the present, Catherine jokily turned to her husband and responded, “We will just have to have more babies!” Could this be a sign that the couple are planning to extend their family soon? We certainly hope so! 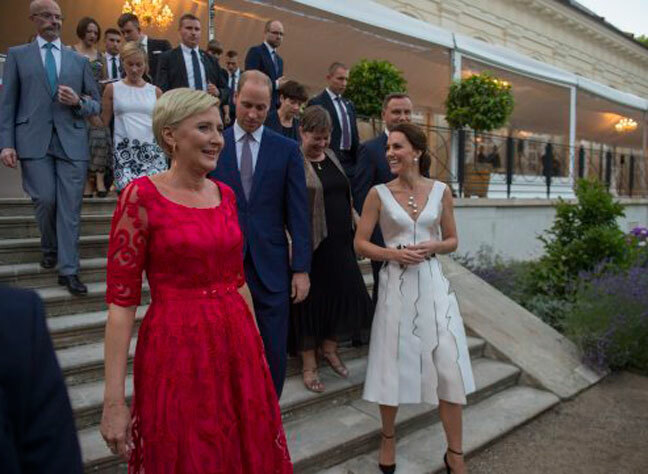 Catherine and William then later attended a garden party in the city of Warsaw, held in the Queen’s honour. The Duchess donned a custom white and black Gosia Baczynska gown for the evening – a clear homage to the country they’re currently touring. The couple spent time chatting and laughing with members of the exclusive party, and later raised a toast to the Queen herself. William also paid further homage to his grandmother, reading back a message from the Queen which highlighted the close ties between Britain and Poland. The couple were also met with a huge crowd of fans and well-wishers as they arrived into the country, many of whom went excitedly with presents, signs, notes and cameras at the ready. One fan in particular, 21-year-old student Magda Mordaka, told of how the Duchess denied her natural good looks after Magda commented on how beautiful she is, shrugging off the compliment by simply saying her good looks were down to make-up.